From the BCS web site: “The Best of BCS, Year Three features such authors as Richard Parks, Garth Upshaw, Margaret Ronald, Matthew Kressel, Geoffrey Maloney, and World Fantasy Award-winner Steve Rasnic Tem. Special offer going on– buy The Best of BCS, Year Three from Weightless Books between now and Oct. 19 and get a free copy of Best of BCS, Year One or Best of BCS, Year Two. You can also pick it up at all the usual places, Amazon, B&N, Smashwords…..here’s the thing–proceeds from the sale of The Best of BCS, Year Three go to pay BCS authors and artists for their work and keep the magazine going. Two subjects near and dear to my heart, it has to be understood. Okay, commercial over. Thanks for your patience. 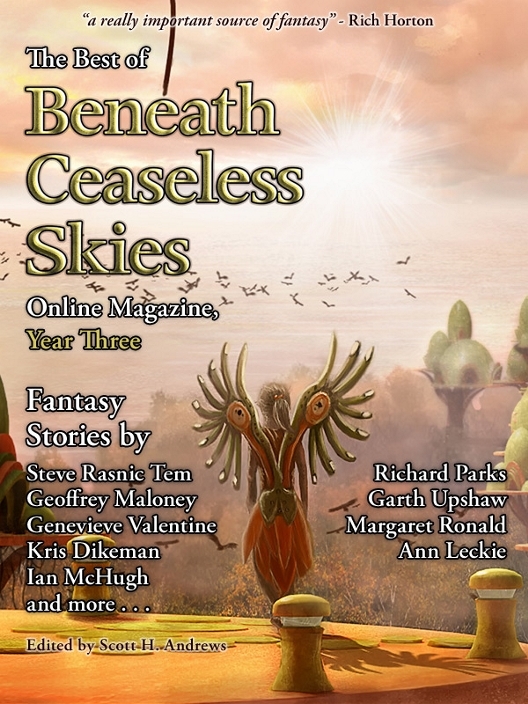 This entry was posted in Anthology, Folklore, legends, Writing and tagged adventure fantasy, Beneath Ceaseless Skies, Genevieve Valentine, J. Kathleen Cheney, Lord Yamada, Short Stories, Steve Rasnic Tem by ogresan. Bookmark the permalink.